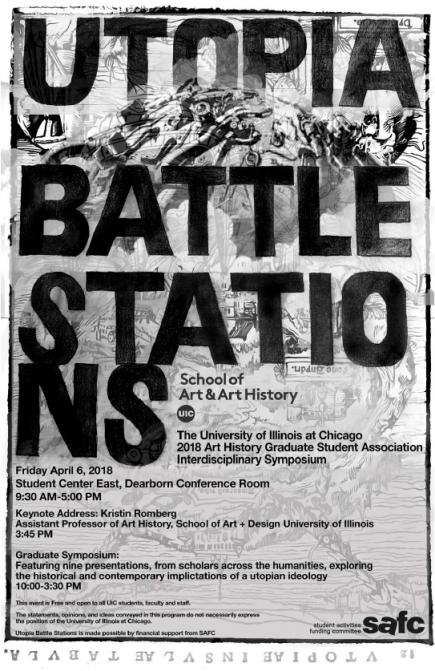 Graduate Symposium at the School of Art & Art History at the University of Illinois at Chicago. Featuring Presentations from Erin Madarieta, Kaveh Rafie, Ethan Madarieta, Alan Smart, Wylie Schwartz, Zach Rotterman, Sebastian Mühl, Jennifer Hankin, and Hannah Bruckmüller, exploring the historical and contemporary implications of a utopian ideology. Keynote Address: Kristin Romberg, Assistant Professor of Art History, School of Art + Design, University of Illinois.